Particularly: Mention some missing glitches, such as lying down to get Bulbears to push you through the wall, cutscene skipping, etc. This is a collection of glitches possible in the first Pikmin game, as well as its New Play Control! remake. 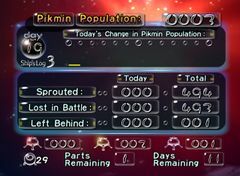 Effects: The Pikmin counter will display erroneous numbers, including a total of Pikmin on the field that doesn't correspond to the truth, and a number of Pikmin on the party superior to that of the field number. How to: So far, there is no known way to trigger the glitch on purpose. It seems to happen most often when Pikmin die with unconventional ways, especially by being killed by the Smoky Progg's smoke trail. It also happens with some frequency with deaths caused by The Forest Navel's abysses, and when several Pikmin die at once. Finally, it can also be related to some bridge glitches. Notes: A similar glitch can also happen in Pikmin 3. Possible explanation: Some of the possible Pikmin deaths must override the standard "killing" procedure. When certain, as of now unknown circumstances happen, the code will not handle deaths the normal way, and the Pikmin counter won't be updated correctly. New Play Control! Pikmin: Yes YouTube video (at 1:46) Example animation, viewed from under the ground. Effects: Compresses a Pikmin through the ground, killing it when it touches the pit. How to: When battling an enemy, there is a chance that some Pikmin will mysteriously vanish without leaving a spirit or making a sound. There are several enemies where this happens, but the most common are Wollywogs, Red Bulborbs, and the similar enemies. It also happens with more regularity when swarming enemies rather than throwing Pikmin at them, and it's more likely to happen the more Pikmin are used. It can also happen after combat, when the enemy is falling, and with pellets. Notes: This glitch is more frequent in the New Play Control! version, and can also happen in Pikmin 2. 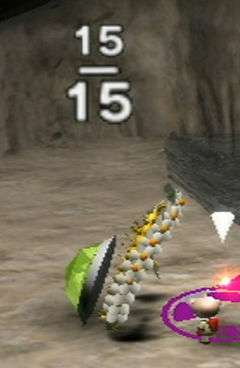 This behavior may have been intentional at one point in the game; some prerelease footage shows Pikmin being killed by a Yellow Wollywog corpse. Possible explanation: During combat, Pikmin get pushed around by the enemy and its hitboxes every which way. At times, some Pikmin might be pushed downward and outwards, but there's more force driving it downwards than forwards (for instance, if other Pikmin are keeping it from sliding off). If the force is too great, the Pikmin is pushed through the ground, where it falls and dies. Effects: Causes a non-Blue Pikmin to remain drowning indefinitely without dying. How to: Take any non-Blue Pikmin and either toss it into the water or just run into the water with it, thus causing it to drown. If you whistle and run into the Pikmin, the Pikmin may then restart its drowning sequence, which allows it to stay in the water for an extended period of time. This can be repeated for as many times necessary. The Pikmin will still drown eventually if they are not called to shore or if the glitch is unrepeated. Notes: This can be used to get non-Blue Pikmin into areas otherwise inaccessible, most notable on the rise where the Sagittarius lies. It's also possible to bump into the Pikmin and make it reset its drowning state without whistling, despite being harder. A similar glitch can also be done in Pikmin 2, but the method is different. Possible explanation: When Olimar bumps against a drowning Pikmin, if the hitboxes align correctly, the Pikmin will be pushed out of the water temporarily, thanks to the collision system in the game. This is enough to let the Pikmin get a new breath of air. Strangely, the Pikmin can also go below Olimar, where it will also regain its air; it's possible that the Pikmin goes through the ground, and touches a bit of the geometry that doesn't contain water. The fact that this glitch is much easier to perform if Olimar is whistling must be because the hitboxes are aligned differently and more conveniently. Main article: Throw#High ledge glitch. Effects: The Libra will bounce off the map and be forever unobtainable, making the game impossible to complete (the Libra being one of the 25 required ship parts). Prerequisites: Have the Libra uncollected. How to: This glitch happens at random, but cases of the glitch occurring are not uncommon, so you shouldn't assume it won't happen to you. The glitch happens when the Pikmin carrying the Libra from the ledge it sits on fall down, making the ship part bounce up and potentially land outside the area and into the abyss. Notes: To avoid suffering too much from this glitch, try to get the part as soon as the day starts. If the glitch happens, you can restart the day without losing any other progress. Restarting is highly recommended, seeing as the part will rarely come back. There are reports of the Libra occasionally respawning elsewhere, though. In the New Play Control! version, one can redo any day, so saving at the end of a day in which this glitch happens is less harmful. What would happen normally: The Libra should bounce a small bit, certainly not enough to make it go flying. Possible explanation: The part is situated above high ground, on a very precarious and small ledge. When handling collisions with the ground, the game is programmed to make ship parts bounce off. Seeing as this is a rare scenario, though, that code wasn't optimized that much, resulting in the bouncing to be erratic given some circumstances. New Play Control! Pikmin: ? Effects: Allows Olimar to slightly move objects than can only be moved with Pikmin. Prerequisites: Must be day 2 or later (since Olimar cannot lie down on day 1). How to: Lying down next to an object such as a pellet or ship part may cause it to move slightly. However, it must be repeated several times to move something any significant distance. The best way to do this is to get a running start at the object and lie down at the moment of impact as Olimar naturally bounces back from colliding with objects. Doing this at different angles will move the object as well, but with less distance. The biggest push is made from directly facing the object or directly facing away, though it can be difficult to position Olimar properly while facing away. If you're holding any other button while pressing the button to lie down, Olimar will only start to lie down and then pop back up; this will still move the object but not as far. A Yellow Wollywog can also be used to nudge parts – when a Yellow Wollywog lands on top of a part from a jump, it pushes it away. Finally, Pikmin carrying Olimar can also push other things in the way; this too can be used to move ship parts around. Notes: Different objects have different resistance to being moved by Olimar: some will be dragged a good distance with a well-timed lie down, whereas others will only move a tiny distance, even with the best possible execution. Dragging an object with little resistance into an object with higher resistance is a good way to help with this. Possible explanation: Two carriable objects push each other off. Olimar can become a carriable object by lying down. Effects: Makes Captain Olimar ride on top of a large enemy, and go out of bounds this way. How to: Lure a Spotty Bulborb or Spotty Bulbear into a place where you can get on a platform that's roughly its height, and have it stay on ground lower than you; the erratic height platforms near The Distant Spring's landing site work well here. Get close to it so that it'll lunge forward. When it misses, quickly climb on its back. You can influence which way the creature should go by standing on its edge, in that direction. It will attempt to bite you several times by lunging forward; try to avoid falling off. With practice, you can lure it towards other ledges that are its height, but lead to places out of bounds. What would happen normally: It should be impossible to ride on top of enemies. Possible explanation: Bulborbs and Bulbears have tall hitboxes, of course. The top of these hitboxes makes for something like solid ground, and there's no problem in this, seeing as Olimar is never meant to go on top of them. It's still possible to ride on them by going to certain ledges. The fact that a Bulborb's eating lunge throws them very far forward, even partially through the walls, allows Olimar passage to their tops. Effects: Makes a Swooping Snitchbug clone one or two Pikmin. How to: Go to an area with a Swooping Snitchbug and lure it to the landing site. Get any type of Pikmin out. Put the Pikmin in the Onion when the Swooping Snitchbug swoops for them. If done correctly all of the amount of Pikmin will go in and the Swooping Snitchbug will have one or two in its hands. Possible explanation: A Swooping Snitchbug that successfully grabs a Pikmin will keep it on its claws. However, while climbing unto an Onion, Pikmin are in an uninterruptible state, so they will actually continue climbing instead of being caught. This creates an extra Pikmin. Effects: Makes it possible to partially control a Mushroom Pikmin. Prerequisites: Have a living Puffstool in the area. How to: The timing is important for this glitch. If Pikmin are left near the Puffstool and are called at the exact moment the creature lifts and inverts its cap (just before it blows its spores), the Pikmin may become glitched Mushroom Pikmin and rush to Olimar's side immediately after. Notes: Controllable Mushroom Pikmin cannot be thrown, dismissed or whistled, but they can be controlled. They can follow tasks such as carrying an object or plucking grass, but once the task is completed, they'll return to their normal Pikmin form. They can also be taken into an Onion, where they'll reemerge as Pikmin of their original type. Normal Pikmin will attack these Mushroom Pikmin, so care should be taken. Possible explanation: When the player whistles a Pikmin, it attempts to join their party. If the Puffstool possesses the Pikmin while this is happening, the Pikmin will cancel its attempt to join the player, and become possessed. On the other hand, if a Pikmin is whistled while being possessed, the party joining attempt will be ignored altogether. If, however, both events happen simultaneously, the game will both turn the Pikmin into a Mushroom Pikmin and add it to the party. The partial ability to control a Mushroom Pikmin comes from the lack of code to handle the control of this type of Pikmin, as this was never intended. Effects: Makes Pikmin die by falling through the ground. Prerequisites: Have built the bridge closest to the Blue Onion in The Forest Navel. How to: Head to the bridge closest to the Blue Onion in The Forest Navel, and issue some Pikmin to go under it. Dismiss them, then go to the exit (lower part) of the bridge. Finally, whistle your Pikmin to come to you. Basically, you want the Pikmin to walk towards the acute angle of the bridge, while under it. Some Pikmin should disappear and die. Notes: This glitch is much more reproducible in the New Play Control! remake. Possible explanation: The corner the bridge makes with the ground is just too sharp, making collision detection with the floor harder to do correctly. The bridge keeps pushing Pikmin down as they walk towards the angle, and because the floor's hitbox is just a plane, not a bulky prism, it gives in to letting Pikmin go through it more easily than the bridge does. Prerequisites: Have access to the beach at The Impact Site. How to: Bring a very large group of Pikmin and head to the Pearly Clamclamp at the beach of The Impact Site. Throw a Pikmin at it, and while it is reeling back to attack, go to the back of the enemy, and use group moving to compress the Pikmin against the clam's hinge. When it snaps, some of the Pikmin standing near will disappear and die. Effects: Makes Pikmin go out of bounds, where they can slide back into the area, go far enough to be irretrievable, or slide the opposite direction, where they will fall off-screen and die. Prerequisites: Have a living Goolix on The Impact Site. How to: If the Goolix is near the right of the tree-stump arena and the yellow, brain-like nucleus is hit by a Blue Pikmin, that Pikmin, or the other Blues that are attacking the smaller, blue nucleus may be knocked into the out-of-bounds, forest like terrain. Notes: In New Play Control! Pikmin, the Pikmin are not knocked hard enough to be unreachable, and the whistle's range allows them to be called back. What would happen normally: The Pikmin should be unable to go too far out of bounds. Possible explanation: The collision between the Goolix' nuclei is meant to throw away all nearby Pikmin. If the creature is too close to the edges of the area, it's possible for the fighting Pikmin to be thrown off. Not much was done to manage Pikmin that go out of bounds, as that scenario was thought to be too unlikely. Effects: Makes a Mushroom Pikmin attack the Puffstool rather than Captain Olimar. Prerequisites: Have a living Puffstool on the area. How to: While fighting a Puffstool, try having a Pikmin be knocked down at the same time it's affected by the Puffstool's spores. Upon getting up, the Pikmin should change to a Mushroom Pikmin, but its skin should turn into a pale shade of its normal color, and their mushroom will glow, as if they were idle. It is also possible to have this happen if the Puffstool loses all of its health at the same time it starts to flip upright. It will die, and the rebel Pikmin will carry its corpse. Notes: Rebel Mushroom Pikmin cannot be called to the player's side, and normal Pikmin will still attack them. After carrying something to an Onion, those Pikmin return to their normal selves. Possible explanation: A Pikmin is programmed to continue attacking an enemy after it's knocked down by it. Normally, the spores both stop the Pikmin from attacking the Puffstool and possess the Pikmin, but if it happens while a Pikmin is lying down, the possession will occur as normal, but the code that triggers when a Pikmin gets back up goes into place, making the Pikmin attack the Puffstool regardless of the possession. Effects: Prevents Pikmin from being called, but only for about 15-20 seconds. Prerequisites: Have at least one ship part uncollected in the area (besides the Secret Safe). How to: Make Pikmin carry any ship part back to the Dolphin. When they get close to the ring of light next to the Dolphin, stand in the middle or close to the the middle of the Pikmin. When the ship part is retrieved and identified, call the Pikmin back with the whistle. The Pikmin will appear to be called, but then revert back to their dismissed state. It will take a few tries, but the Pikmin will be called back eventually. Possible explanation: It could have something to do with when you touch a Pikmin, it automatically calls the Pikmin back. But right after the Pikmin collect a ship part, you are touching them, a cutscene just played, and the game thinks the Pikmin are called back. Main article: Pellet#Three Pikmin carrying a 1 pellet. There is a rumored glitch that allows 3 Pikmin to carry the same 1 pellet. It is currently unknown if this glitch is real, or a misinterpretation of some images and videos. Effects: Makes it possible to throw a Red or Yellow Pikmin while Olimar is underwater. How to: Have a non-Blue Pikmin on the shore, but within reach of the whistle. Have one or more Blue Pikmin with you on the group. Whistle the Pikmin at the shore, and while it's walking towards Captain Olimar, grab onto the Blue Pikmin and press to grab the other Pikmin. Right after, throw the Pikmin somewhere else, like a different shore. Effects: Puts a Puffy Blowhog stuck on top of a skull, endlessly repeating its falling animation. How to: Go to The Distant Spring, gather some Pikmin, and make it so that the Puffy Blowhog near the landing site hovers on top of a skull as it stops to inhale. While it is busy attacking, throw Pikmin at it. When it falls on the skull, it should permanently stay on it, in its fall animation. Notes: This can be used to defeat the enemy without it being able to shake the Pikmin off. Possible explanation: The enemy only performs its landing animation when certain spots of its underside detect a ground. These points do not coincide with the ones that control the physics portion that stops it from falling through the skull. This means that while the physics code is detecting the skull's uncertain terrain as ground, the script for the landing animation is not. Effects: Makes the Smoky Progg fly, go out of bounds, and gain a lot of speed. It can also push other enemies and Olimar out of bounds. Prerequisites: Be on day 15 or lower. How to: Awaken the Smoky Progg without killing it. It'll then go to the landing site. After a while, it'll start following Olimar if he has at least 1 Pikmin with himself. The Smoky Progg can follow the Captain everywhere in the map as long as he is close to the enemy. The Progg can then be lured into small walls and tight crevices, where it can go out of bounds. At random times, it will start picking up a lot of speed, which it loses when it reaches the landing site. Effects: Makes a Yellow Wollywog stuck in the jumping animation. This can be helpful to the player, as the Yellow Wollywog won't be able to attack, but it also stops the player from bringing the corpse and its pellet to the Onion. How to: On The Final Trial, in Challenge Mode, there is a Yellow Wollywog near a pipe. If the Yellow Wollywog jumps on the hole in the pipe, it gets stuck there; it can be coerced into doing so by moving Olimar onto it. Notes: While stuck, the creature cannot be harmed; it remains in its jumping animation and cannot be brought out of it. Possible explanation: The Yellow Wollywog only contains code that handles its collision with the ground. The pipe doesn't necessarily count as ground, but rather as an object. Either that, or the pipe only counts as having slidable walls, and these walls keep pushing the Wollywog inwards, and seeing as there isn't enough space for it to go through, it gets stuck. Effects: Makes Pikmin stay with and chase after Olimar after he whistles everybody into the Onions, and while he enters the S.S. Dolphin. How to: Have a small number of Pikmin on the field, go to an Onion, and call out a large number of Pikmin. When they're leaving the Onion, end the day from the pause menu. The Pikmin should continue sliding out of the Onion during the cutscene, and those that came before Olimar's dismissal will still stay next to him. For the best results, have 0 Pikmin on the field when you start, call 100 out, and end the day as quickly as possible after calling them. Notes: These Pikmin stay outside the Onion while the S.S. Dolphin takes off, but on the cutscene after that one, with the nocturnal creatures, the Pikmin in question disappear and everything returns to normal. This glitch is merely cosmetic, i.e. the Pikmin that stay behind do not die. A glitch with a similar effect can also happen in Pikmin 3. Possible explanation: Unlike in Pikmin 2, there is no code to stop the Pikmin extraction process when the sunset cutscene starts. Effects: Makes an Onion spit out a seed that has a bud or a flower. This only affects the seed in mid-air; the buried Pikmin will still be a leaf when its stem pops out of the ground. How to: Pluck a bud or flower Pikmin. It does not matter how this Pikmin became buried in the first place. Straight afterwards, make any Onion spit out a seed. This new seed will have a bud or flower, matching the type of the plucked Pikmin. This can extend over multiple Pikmin, too. For clarity's sake, imagine there's a queue. Whenever you pluck a Pikmin, its maturity gets placed on that queue. Whenever a seed is expelled, it will use the same maturity as the head of the queue. If the queue is empty, the seed will be a leaf. What would happen normally: Any expelled seed should always be at the leaf stage. Possible explanation: By checking the game's memory, it's clear that the game has a number of slots in memory to hold data about seeds/buried Pikmin. These slots have data for, amongst other things, the Pikmin type, the maturity, and the coordinates. Whenever an Onion creates a seed, it grabs one of the vacant slots, and rewrites any old information left there with whatever information matches the new seed. The exception to this is the maturity information, which is mistakingly kept. This particular field starts with the value 0 (for leaf), which explains why most of the time, a leaf seed comes out. This data slot is occupied up until the moment the leader plucks the Pikmin, where it is marked as vacant, but its information is kept. The reason a bud/flower seed turns into a leaf after it goes into the ground might be because its "time left underground" variable starts incrementing, which updates the Pikmin's maturity. Effects: Makes the whistle not produce any sound. It will still work like normal, though. How to: Whistle once and hold it. When you let go, press and hold / again almost instantly afterwards. If you're having trouble, it might be easier to mash the button two or three times very quickly, and holding on the last time. Notes: The whistle button must be released for exactly 1 frame in order for it to work. In New Play Control! Pikmin, the Wii Remote's volume must be set to 0, as this glitch only works if the whistle sound is coming from the television, not from the Wii Remote's speaker. The volume can be changed on the Home menu, accessible by pressing . Possible explanation: The whistle sound still lasts for one frame after the button is released. After that, the game stops the playing whistle sound. If during this time, the player presses the button again, another whistle will start. The game then stops the sound, regardless of it being a different whistle. Effects: Makes water splash particles constantly and rapidly appear. Prerequisites: Have access to The Forest Navel. How to: Go to The Forest Navel. Pick several Blue Pikmin, preferably 100. Go to the lake at the southwest where the Anti-Dioxin Filter is. Go to the western wall and use group moving to direct your Pikmin into the wall. This glitch also happens when (any type of) Pikmin are on the edge of the water, so it can happen accidentally as well. Notes: The more Pikmin are generating particles, the louder the sound will get. Use caution when performing this glitch. Possible explanation: Whenever Pikmin go from being out of water to in, these particles appear. If the Pikmin stays on the border, such that they're between grounded and submerged, the particles will continuously appear, until the game fully acknowledges the Pikmin as being underwater. For The Forest Navel, the edge of the water is where the wall is, and Pikmin going towards the wall are left just on the edge. Effects: Shows the particle effect for Olimar's antenna light during the sunset menu. Prerequisites: Have access to The Forest Navel or a later area. How to: On The Forest Navel, The Distant Spring, or The Final Trial, during the sunset gathering cutscene, Olimar starts by walking forward towards the ship, and then he stops, looks to his left, and then to his right. When he is looking to his left, press / to skip the cutscene. Notes: Since this involves skipping the sunset cutscene, it is not possible in the North American or Japanese versions of the GameCube original. Possible explanation: Since the S.S. Dolphin, Olimar, and the Onions have to fly away during the sunset menu, the game keeps those objects loaded when the day ends, but unloads everything else. The coordinates for Olimar's antenna light are not cleared, nor are they programmed to follow Olimar during the sunset menu, so the light stays in place from the moment the cutscene is skipped. Coincidentally, The Forest Navel's landing site is very close to the coordinates where the sunset menu takes place, and by "freezing" the light in a specific spot, it actually appears on-camera during the menu. Effects: Breaks the sunset cutscene. How to: Let Captain Olimar take enough damage to be knocked out, but right when the final hit connects, pause the game and choose to go to sunset. The sunset cutscene will play, but Olimar's antenna won't have any light, the Pikmin will not gather up and will instead become invisible, all bundled in one spot (only visible because their idle glow is still there), the S.S. Dolphin and the Onions will not have any lights or effects, and finally, the Onions will stay there instead of lifting off. The sunset sequence plays out like normal besides that. The voyage log entry for Olimar's first knockout can still happen with this glitch. Notes: Through unknown circumstances, it's possible for the glitch to not happen, even when everything makes it seem like it should. Olimar is still technically counted as dead, as proven by the sunset screen being able to choose the first knockout voyage log entry. Possible explanation: When Captain Olimar is knocked out, the game sets up cutscene details for the corresponding cutscene. If this gets interrupted by the regular sunset cutscene, the objects and animations of that cutscene will interfere with the already-prepared ones, which will cause undefined behavior in the cutscene. Effects: Makes the game stuck waiting for a cutscene to end, with no way out. How to: Start a new save file. After gathering 10 Red Pikmin, go towards the cardboard box. Place 9 Pikmin on the box, and then throw the 10th at it. Then, try to make it so that you whistle at least one Pikmin the exact moment the 10th Pikmin lands. It's better to whistle too soon rather than too late. If you whistle too soon, you can try again right away, but if you whistle too late, the cutscene will start and you'll have to restart the save file again to retry. If you call in Pikmin just when the cutscene starts, the box won't be able to move, and the cutscene will never end. Notes: Because the game expects the box to get to its final place until it ends the cutscene, it'll be waiting forever. The music will keep going, but nothing else will happen. The only thing left to do is to reset or shut down the console. In New Play Control! Pikmin, the glitch cannot be performed, not even with frame-perfect timing via emulator. Possible explanation: Instead of having the cutscene last for a fixed duration of time, the developers chose to have the cutscene end when the box reaches its destination; this would allow changing Pikmin pushing speeds without having to change the cutscene duration. When the cutscene starts, some parts of the gameplay still take effect for some frames, such as the final bits of the whistle's range. This allows the Pikmin to be called back while the cutscene is playing. Because the game must wait for the box to reach its destination, it remains waiting forever. Effects: Makes an object in the area teleport to somewhere it shouldn't, and cause the game to draw random parts of its geometry on top of the screen. How to: There is no known way to reproduce this glitch at the moment. Notes: This only seems to affect objects that have been carried in the past or are currently being carried. Effects: Some objects can get embedded inside walls, the floor, or other objects, making retrieving them impossible in some cases. How to: Occasionally, a ship part or a pellet can become partially embedded inside a wall or another object. It can be possible to move the object against the spot it's stuck in, though that can either set it free or burrow it deeper. Issuing Pikmin around these objects is sometimes pointless, as they'll be unable to distribute themselves correctly over it, and thus, be unable to carry it. For a stationary and partial example, there's the Blue 20-Pellet on The Final Trial in Challenge Mode. Notes: This glitch can also happen in Pikmin 2. Possible explanation: Objects may become embedded for a variety of reasons, but mostly, it's due to them being pushed inside walls by other objects. This is because the game attempts to avoid having objects overlapping one another, and as a last resort, an object is embedded against a wall. Effects: Makes a captain go inside a gate. Prerequisites: Have an unopened gate you can get on top of. How to: Get on top of a gate, somehow, like by riding on an enemy's back. Then, simply press / to lie down. You should fall through the gate and be inside it. You can move around, but if you walk out, you can't walk back in. Possible explanation: Laying down puts Olimar in a state that lacks some form of solidity, this can be backed up by the fact that Olimar cannot be hurt while lying down. Likewise, Olimar mustn't be able to collide with the top of gates while lying down, which makes him fall through. Effects: The Onions won't have their rings of light out, and won't be able to be interacted with. Prerequisites: Have uncollected ship parts, besides the Secret Safe. How to: Bring a ship part that has not yet been identified (i.e. Olimar has yet to come close to the piece and comment on it) close to the S.S. Dolphin, but not so close that the Dolphin will take it in. The next day, when Captain Olimar comes out of the Dolphin, the part will be identified, and the Onions will be inaccessible. Notes: The only way to undo this is by going to sunset or resetting the entire save file. Possible explanation: The cutscene that plays at the start of each day cannot be skipped, and it should not be interrupted. Normally, one cannot interrupt the cutscene, as the player is unable to control Olimar before the cutscene's end, but if there's a ship part near Olimar when the cutscene starts, the game will recognize the proximity between the Olimar object and the ship part object; this triggers the identification monologue. Seeing as such a process was never meant to happen during the cutscene, the game is unable to complete it, and the Onions will never be able to open their rings of light. Effects: Makes the player able to go out of bounds. How to: Go to an area near the Nova Blaster on The Forest of Hope with Pellet Posies. If there is no Posy inside a wall, try another day. Once you find a Pellet Posy inside a wall, try to go in between to fly out of bounds. Notes: You can use this glitch to get the Radiation Canopy, Geiger Counter and Sagittarius. When you throw a Pikmin at it, the screen will go black and you will be falling. Possible explanation: When two things are in the same spot, the game is programmed to push the movable ones apart. Seeing as both a Pellet Posy and a wall are unmovable, the game will attempt to push Olimar out if he's found to be crammed between both. The ejection will likely push Olimar through the wall, given that technically, Posies have more solid hitboxes than the thin line that makes up a wall. Effects: Makes the Pikmin stop working on a bridge, and circle a pellet, eventually giving up and becoming idle. Prerequisites: Have a pellet under the way of an unconstructed bridge. A good example would be the one with a Yellow Wollywog near the island with the Massage Machine in The Distant Spring. How to: Issue some Pikmin to work on an unconstructed bridge that has a pellet further ahead, under the bridge. The Pikmin will gradually work on the bridge, until the point where the pellet is below them. They will stop working on the bridge, and circle the pellet in an attempt to grab it. They will eventually give up, sigh and become idle. You can then call them and issue them to rework on the bridge. Notes: In some rare cases the Pikmin can fall through the bridge, but instead of drowning, will sit safely on top of the pellet. If such a Pikmin is whistled at multiple times, it will fall off the side of the pellet and land in the water. Possible explanation: When one of the bridge's portions is created, the Pikmin stop working on it for half a second, because they have to move forward in order to work on the next bit. During this period, they are considered partially idle, and if they detect something like a pellet in the vicinity, they'll attempt to get close to it. Pikmin are programmed to circle an object, regardless of the vertical distance, as it's normally impossible to have a pellet above or below a Pikmin. As such, they go to their chosen spots around the pellet, but still on top of the bridge, which are the closest spots to the ones they want to go to. Because they don't actually grab the pellet, they'll give up after a while. Effects: Makes the explosion sound of a set of bomb-rocks not play. Prerequisites: Play on a day where there are a lot of bomb-rocks. How to: Gather as many bomb-rocks in the area as you can find. A good place would be The Final Trial on Challenge Mode. If you make them more than 8 or so explode at once, the explosion sound will be either extremely loud and cut off after a split second, or it might not even play at all. Notes: Try not to have your device's volume set too high. Possible explanation: Most games limit the number of sound samples that can play at once. Normally, not many sounds need to play simultaneously, so this value probably isn't more than 10 in Pikmin. The code that silences a sample or sample instance must be made in such a way that if the same sample needs to play several times in a row, it can actually cut off all instances of the sound that are playing. Effects: Makes the game softlocked by not progressing the sunset cutscene. Prerequisites: Be on day 2 or later. How to: Pause the game, and choose the option to skip to the sunset. While the menu box is fading out, start mashing . If you managed to press the button in the required time, you will hear the sound effect that plays when you pause, the screen will go black to start the cutscene, and when the image comes to, you'll see the start of the cutscene, without anything else advancing. Notes: This glitch only works in the Japanese version of the game. The player has a 1 frame window in which to perform the button for the glitch to happen, so mashing is recommended. Effects: Makes some objects become tilted. How to: Have Pikmin carry an object from a high ledge. Given the object's physics, it may fall down at an angle, and the Pikmin will proceed to carry it in said angle. Some Pikmin might even be holding it in mid-air, while other times, the Pikmin may let the object fall. Notes: This glitch can also happen in Pikmin 2. This is similar to the Libra glitch, except that objects aren't normally irretrievable. Possible explanation: Because of the game's physics and enforcement of gravity on objects, if Pikmin carrying the front of an object fall from an edge before the ones at the back do, the piece will be tilted. This is normal, but given that pieces falling from high places isn't common, the game doesn't handle it too well. Occasionally, it'll leave the piece tilted as the Pikmin are carrying it. Effects: Makes a bridge have two sections, each with a rolled up bundle of sticks, one of them floating in mid-air. Prerequisites: Have a built bridge. How to: There is no known way to cause this glitch purposely. Randomly, Female Sheargrubs will eat a bridge, but it'll be split, with the half opposite to the side being eaten float in mid-air. The following glitches are too insignificant to warrant their own section, but are included for completion's sake. 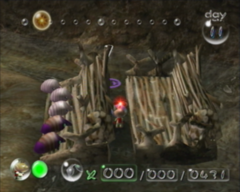 Some obstacles (such as the cardboard boxes) are surrounded by invisible walls to prevent the player from throwing Pikmin to the other side of the obstacle. However, even after moving the obstacle in question, the invisible walls do not disappear. This glitch also occurs with the paper bags in Pikmin 2. By simply walking on a bridge, Captain Olimar will spin erratically. This works best on the Northern bridge of The Final Trial, while walking North. In the New Play Control! version, if you try to fix the camera behind Olimar by pressing , it will make it spin in the direction in which Olimar's body was when the button was pressed. In New Play Control! Pikmin, it is possible for Pikmin building the southern bridge at The Forest Navel to shrivel up and die with no apparent cause. It is possible for some Pikmin next to a red pellet to move a bit away, quickly, in an erratic manner. If the player throws a Pikmin the moment a Swooping Snitchbug tries to grab it, the Pikmin will squeal, but remain idle in mid-air, and eventually bury itself. If a Pikmin holding a bomb-rock touches the pit, an invisible, silent explosion will take place on roughly the same spot, but at ground level. In New Play Control! Pikmin exclusively, on The Forest Navel, in the corridor leading up to the Blue Onion, if the player aims the cursor near the area of the Fiery Blowhog in the Libra's path, there are some spots where the throwing cursor will disappear, and only the Wii Remote's cursor will show up. If the player hugs the western wall and throws Pikmin when the cursor is in this state, the Pikmin will be thrown with a lot of force at the wall, and will bounce back up and be flung off high in the air in random directions. If a reinforced wall is opened right as the day is ending, such that the jingle plays, but the gate only lowered one level before the sunset cutscene, the gate might become corrupted. The next day, it can start with the last third remaining, but upon being blown up, the game will instantly place it at the second level, play the task completion jingle, and then lower the gate by one, meaning it will still remain with the last third left. After this, the gate cannot be interacted with, but it can still block the way. For unknown reasons, a Pikmin can get stuck in mid-air, in the animation where it is clinging on an enemy and pummeling it. For unknown reasons, a thrown Pikmin can keep going without falling down, in New Play Control! Pikmin. It will stop when whistled. It is possible for a Yellow Wollywog to push another one through the floor. If the player is moving the group and goes to pluck Pikmin, the move fanfare will continue playing even if the player isn't moving the group any more. It will only stop when Olimar stops plucking. Given unknown circumstances, it is possible for a colored light to appear on The Forest Navel. By throwing a Blue Pikmin, a Yellow Pikmin and two Red Pikmin at a climbing stick at the same time, they'll stay on the base on the exact same spot, whilst repeating their climbing animation. This will make them look like a merged Pikmin hybrid. If collection of the Positron Generator unlocks access to The Distant Spring, the game will show the propeller-looking object on the side of the S.S. Dolphin during the ship upgrade cutscene, but after that finishes, it will be missing. The propeller will return once the day ends. This also happens when The Forest Navel is unlocked if the Positron Generator is collected prior to discovering Blue Pikmin. If a Swooping Snitchbug grabs a non-Red Pikmin and flies over an active fire geyser, the Pikmin will catch fire and burn in mid-air. It is possible for some sound effects to go mute. The reason for this is unknown. Occasionally, most often on the area-select screen and the end-of-day screen, it is possible for a glowing light to appear on the edge of the bottom left corner. The light bears resemblance to the glowing spot on the Onion sprite on the end-of-day screen, and will appear partially cut-off. The cause is unknown, and it is known to occur on the New Play Control version. It is possible for a Mamuta that was just killed to shake violently for a second before continuing with its death animation. This page was last edited on April 24, 2019, at 18:28.